“All American made” Each one of these old U.S Silver Walking Liberty half dollars of which are in Extremely fine condition (minted 1916 - 1947) is first layered in pure Bright Silver. Then the figures of each are highlighted and brought to life with rich pure 24K Gold (this gold work is done by hand). This breathtaking and exclusive work turns these coins into stunning and true works of art. Each coin is hermetically sealed against wear in clear, hard acrylic coating. 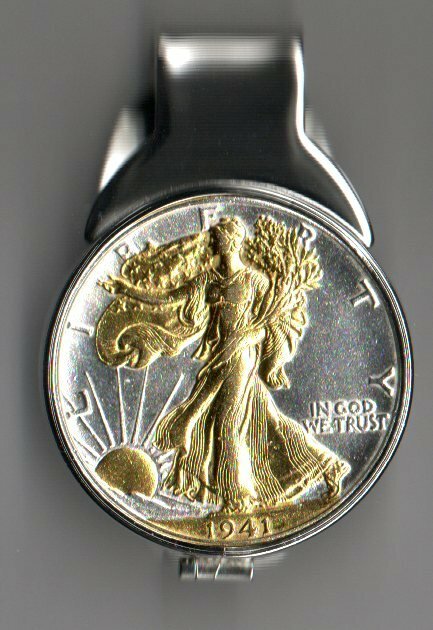 Each coin comes mounted in a patented spring loaded Stainless Steel clip. (Total size of clip 1-1/4“ x 1-7/8“ ) that will hold just one bill or a number of bills (now that last bill won’t slip away). Ships in a jewelry box. Dates may be different then the one shown. The gold is real 24k, not paint.